Are you tired of life? Ready to walk away from it all just for a little while? Do you dream of white sandy beaches and blue waters? It is time to say F--k it All and Go Sailing. Go find out where the sky meets the ocean. Take in scenic views of the mountains. Watch the whales as the spout water. It doesn't matter what you do as long as your phone is off, your stress is gone, and you get a break from life. 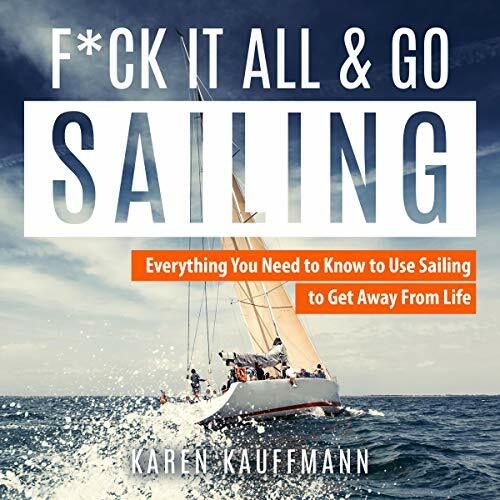 This book is designed to help you sail away from it all. The description is accurate and explains many of the aspects of sailing for the beginner with pretty good detail. There is so much terminology and concepts to know and quickly goes from one to another, expecting you to remember everything she has said as she builds upon it all. Highly recommended. Excellent!!! What I liked the most about this sailing that it was comprehensive in that it covered all areas of basic sailing in an organized but simple to understand approach. A dream of mine is sailing in retirement and with limited knowledge, I'm reviewing all I can. This book was very basic and informative and completely enjoyable. Good, listen. Great book for the beginner! Great book for the beginner! Good for sailors that need a brush up on spinnaker handling and reefing. Well done. Very informative and well taught. Very informative and well taught. The author has the soul of a teacher and is completely in her element here. This audiobook will not disappoint. I can honestly say that as a beginner sailor, I learned a lot of stuff just by listening this book. I have come back to it multiple times and find it is a great refresher right before I head out on the water. Recommended. I have never written a review about anything in my entire life but couldn't help myself because I'm totally baffled by what I just listened to. This book comes nowhere near delivering on what's promised in the description. Should you make the same mistake I did, you will find yourself listening to a computer-generated voice running through a dictionary of sailing terminology, very little of which is helpful whatsoever. Further, the narrator (or computer) consistently mispronounces basic sailing terminology. "Gybe?" Really? I can't comprehend how the author listened to this and signed off on publishing such a train wreck on audible. Must have been one of those "F*** it" moments. The other reviews posted on this website cannot be about the same book, or perhaps I'm also missing something here. Enjoyable listen. Very good details about sailing. This book enhances the desire to get started. Highly recommended to everyone. On reflection, based on the story-lines, I guess this wasn't really as good a book as some more adventurous sailing books I've read, but the author writes so well, I could hardly put it down.